American DJ may not be able to promise its customers the world . . . but the company is giving lighting users the “moon” and the “galaxy” with its new Galaxian Gem LED. This unique fixture combines dual RGBW LED moonflowers with a Galaxian-style green laser for a totally “heavenly” 2-in-1 DJ/club effect. The Galaxian Gem LED’s two moonflowers, which sit on either side of its laser, are packed with a total of 46 high-output 5mm RGBW LEDs (16 red, 10 green, 10 blue and 10 white). These LED sources produce a multitude of brilliant red, blue, green and white beams, similar to ADJ’s classic Gem moonflower effect, which -- when projected onto walls, ceilings and dance floors – create exciting patterns that will turn any club or performance into a dazzling universe of color and motion. What’s more, the moonflowers are equipped with an LED strobe that adds pulsating flashes of color, allowing users to crank up the excitement level even higher. But the Galaxian Gem LED’s high-energy visual thrills don’t stop there. This amazing unit also features a second eye-popping effect: a celestial-style green laser. 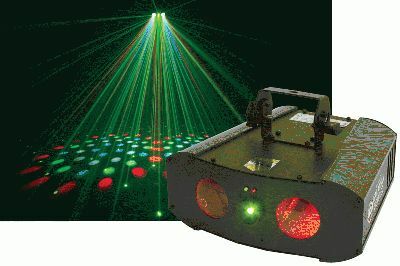 Modeled after ADJ’s popular Galaxian Series, this laser effect fills a room with hundreds of razor-sharp green beams, which dance around the room in smooth, precise movements, driven by high-quality 1.8° stepper motors. This barrage of electric green beams adds a whole other layer of movement and texture to a light show when run simultaneously with the Galaxian Gem LED’s dual moonflowers. It’s also a breathtaking “Liquid Sky-type” laser effect when used on its own. The latest in American DJ’s series of value-driven, multi-effects fixtures, the Galaxian Gem LED offers small clubs and mobile entertainers the convenience and economy of being able to create more than one visual look without having to purchase and transport multiple lighting units. “With the Galaxian Gem LED, you get two very different but complementary effects in one lightweight case, which is obviously a big plus for mobile users,” said Alfred Gonzales, national sales manager for American DJ. “This 2-in-1 fixture is also very budget-friendly, because it costs a lot less than you’d have to spend if you bought separate moonflower and laser effects. Equipped with exciting built-in programs, the Galaxian Gem LED is ideal for users of all levels of lighting experience. It can be operated in 3 different modes: Sound-Active; Master-Slave; or DMX-512 (5 channels). When in Sound-Active or Master/Slave modes, it runs as a simple plug-n-play effect, moving to its own internal programs. Up to 16 Galaxian Gem LED units can be linked together via the unit’s IEC AC In/Out connectors, to cover spaces and venues of all sizes. The Galaxian Gem LED is also compatible with American DJ’s easy-to-use UC3 controller (sold separately), which can be used to turn the unit on/off and scroll through its various programs. Other user-friendly features include an easy-to-navigate 4-button Menu system and On/Off power switch on the rear panel. The Galaxian Gem LED also comes with a hanging bracket and safety hook for worry-free mounting. Maintenance worries will be kept to a minimum too, since the unit’s long-life LEDs have a rating of 50,000 hours. For all its visual excitement, the Galaxian Gem LED uses very little energy, drawing just 20 watts of electricity at maximum use. It features multi-voltage operation: AC 100v-240V, 50/60Hz. Packing an amazing visual punch for its size, the Galaxian Gem LED measures just 11.5”L x 13”W x 8”H/ 290 x 325 x 201 mm and weighs 9 lbs./ 3.7 kg. It has an MSRP of $349.95.